None of the tests for PSA are much good. Most are rather rudimentary, good only for quick QC. Others can tell you things about some key aspects of your formulation, but ignoring others that are equally important. The science says that you need peel AND probe tack AND tensile. That's not a comfortable message but is, unfortunately, true. These tests give the most profound insight into the formulation but don't tell you anything about actual adhesion performance. Of course "different frequencies" is equivalent to "different temperatures" via WLF. Roll a known ball down a known slope and it will acquire a known momentum before it starts to run along a sample of your adhesive. The "tackier" the adhesive the shorter the distance before the ball stops. Given that "tack" is frequency dependent and that the ball's speed (frequency) changes as it slows down, it is obvious that this test is scientifically dubious. However it is an excellent quick QC test: if the ball stops at the same place that doesn't necessarily prove that the formulation is correct, but if it stops at a different place then the formulation is certainly different. A loop of tape is lowered onto a surface of fixed contact area. Once the tape slightly overlaps the surface, the tape is raised and the peel force measured. Again, simple and readily automated for quick QC, with some potential to give more scientific data if speeds and temperatures can be changed in a systematic manner. If the strip thickness is greater than tc then the measured P value is valid. If the thickness is substantially less then it is likely that recorded P is greater than the true value as a lot of your pull has gone into plastic deformation of the film. The default values are for a PET strip being pulled at 5N/m. A 12µm strip would be below the tc value of 40µm so P would be an over-estimate, but for a 50µm strip P would be valid. A perfect probe (which may be defined by high or low surface energy, high or low roughness) is pressed perfectly with known force into the PSA which is mounted on glass so the whole process can be videoed from beneath. The probe is pulled perfectly vertically and the forces monitored whilst the behaviour of the PSA is viewed. This gives the deepest insights into how the PSA deforms and absorbs energy during de-bonding. 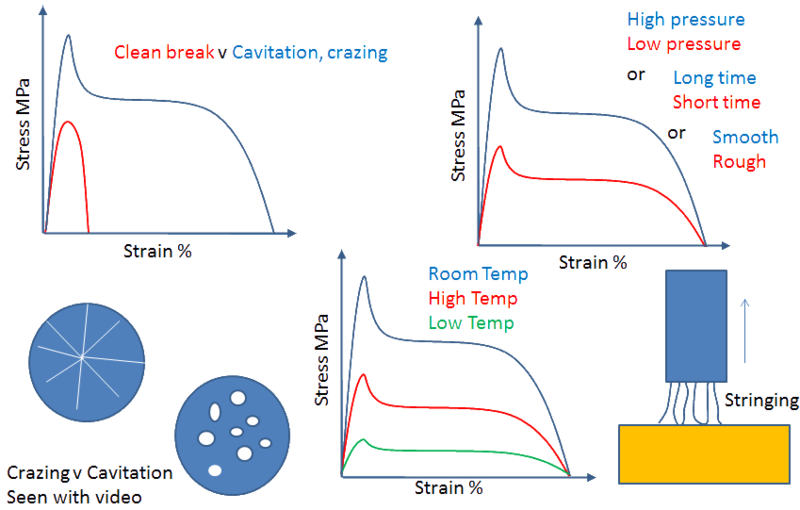 The graphic shows how the stress/strain curves can reveal different things about the system, or how the same curves can be obtained via different sets of test conditions of (applied bonding) pressure, (measurement) time, (probe) roughness and (measurement) temperature. The difference between crazing and cavitation is highly significant and the degree of stringing is also insightful. Unfortunately small differences in "perfection" in any of these steps can be magnified because the vertical pull is scientifically unstable and the de-bonding depends strongly on where cracks first start to propagate, and the velocities/frequencies can be too high to be relevant to many PSA questions. Some of these issues can be resolved by using a spherical probe surface, but this raises other issues and my personal view is to never use a spherical probe. Despite these reservations, a good formulator will learn a great deal about their system from a well-run probe tester. My personal experience is that one learns a lot about a PSA when it is tested on its own in a standard tensile tester. The trade-offs of elastic modulus, plastic extensibility, maximum tensile stress etc. are readily apparent when different PSA samples are compared. 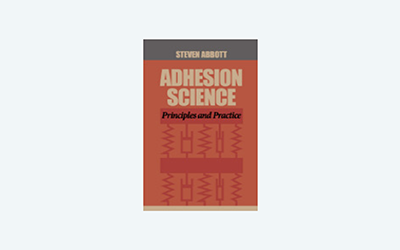 There seems to be no official way to go from a tensile test result to a well-formulated PSA, and tensile testing is greatly under-represented in books and papers on PSA, but some highly experienced PSA formulators have confirmed that they get a lot of value from such tests.